The #EU couldn’t agree on a budget. Everyone is unhappy with it, but each state for its own reasons. Such conflict promises a loss of management and immersion of EU into chaos. .. since the #future is being designed by egoists with no concern for upgrading people’s upbringing. The end of the #liberal global order is clearly visible. Its crisis is a crisis of trust on the part of society. Liberals did not create an image of the common #future—and this is the cause of their demise! The US expected chaos on the streets after the #elections if Democrats lost. But everyone calmly accepted the election results. Mainstream #media lie to win, exemplifying blame of the opponent for everything in the name of liberal demagogy … even more audacious than Russian #propaganda. Creation, Beria, is from the word “Bar“- outside. Creation is the state of desire when it can be above its nature of receiving. What it loves about the Light isn’t the pleasure, but its noble intention of bestowal, acting above one’s interest. and gives it the ability to fill itself with bestowal instead of reception. Spiritual work isn’t against our animate nature, but about rising above it to higher aims, a different state. Don’t fight ego-nature, but gain the quality of bestowal above it. Build a new degree instead of trying to destroy the old one. This sets #Kabbalah apart from religions! We can divide #reality into many parts, feel their connections, “check harmony with algebra,” quantitatively describe our sensations and learn to work with that which was initially just a feeling, #egoistic desire, “evil inclination,” and is then managed by light. Once the Jewish people rise to a higher level of human connection, the nations will replace their hostile attitude toward them with a friendly attitude. 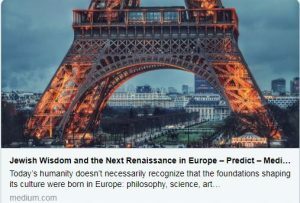 As a result, a new Renaissance will emerge — in #Europe and across the world. The problem is to achieve the correct discernment. After all, who knows how objective I am? It is said that “For a bribe doth blind the eyes of the wise,” and I do not know how it might affect me, whether my opinion is influenced or not. Initially, we try to evaluate things by other standards, like when we compare our children to others’ or our qualities to others’. Egoism operates at all levels, which is why it is so difficult to discern the truth and objectively reveal the flaws in oneself. Therefore, we must ask for the ability to see things as objectively as possible in order to observe and evaluate not from our own perspective, not from Malchut, but from the height of Bina. To the extent that a person receives a portion of the Light, he acquires the ability to distinguish his own opinion from the opinion of the upper Light. Only then can he become a real expert. Soon, the expertise in the spiritual work, the work of the Creator, will become the most popular profession in the world. This is what we are preparing for, and all this work consists of building a network of connections between us. We are ready to say anything with words, but we have no power over our hearts, which leads us to the recognition of evil. Therefore, we must exert effort as if the heart has already been corrected, and the Creator will finish this work for us and correct our hearts. We only need to create the place where He can work. If we complete our preparations, then the Creator will fulfill His end of the deal. Question: On the way to spiritual development, can what seemed bad to me yesterday seem good to me today and vice versa? If so, then what should I believe, what can I rely upon? Answer: That is right. It is definitely possible that what seemed bad to me yesterday will turn out to be good today. And it may also be the opposite. It is possible to determine what is bad and good only in relation to your group, not in any other way. Question: In order to enter into contact with the Creator, must I feel a blow? Answer: Try not to identify with your egoism; that is how you will not feel blows. Question: Is the left line spiritual egoism or egoism of our world? Answer: The left line includes everything. The difference between spiritual and physical egoism is that spiritual egoism is explicitly directed against the Creator, while physical egoism is not explicit. But in principle, it is the same power of reception. Question: What are the principles of spiritual forces being clothed in physical carriers? Answer: In dealing with the wisdom of Kabbalah, we do not see physical carriers, we see spiritual forces. Instead of a person, we see the force he personifies and how he performs everything. The external appearance of a person has no importance for me, not even his actions: is he flying somewhere, traveling, doing something…what is important to me is only how this spiritual force works. 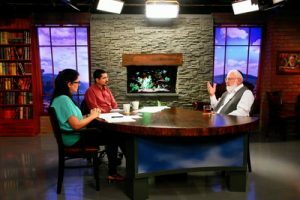 Question: Is seeing what the Creator has created the first attainment? Answer: It is not necessary to see anything. We begin to feel the property of bestowal, the wisdom of faith above us, as a determining characteristic, and this is what manages us. Nothing else is necessary. Question: Does a Kabbalist see the connection between the desire and the force? Is every force a desire? Is every desire this force? Answer: Yes, it is possible to say that the desire and the force are the same thing.